The Spohrs Are Multiplying How many doctors does it take to screw in a light bulb? I love the medical profession, I really do. I mean, it saved my daughter’s life. But I forgot how frustrating it can be when you’re at a teaching hospital. 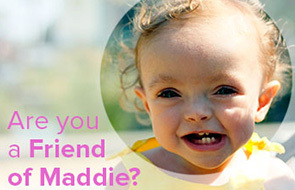 Not because you’re dealing with students who are learning – I’m happy for future doctors to see a baby like Maddie. With so many people looking at Maddie’s information, they are all going to have different opinions. I’m okay with that, too…the more people thinking about my daughter, the better. My problem is they all come by to see Maddie and they tell us what they think the problem is and what they think should happen. So, by the end of the day, I have been told the opinions of two residents, one pulmonologist, two respiratory therapists, two nurses, and one attending. Yesterday we got eight different opinions of the same chest x-ray, and they varied wildly. I spoke or emailed with several people yesterday and no joke, I told everyone something different. Of course, the only opinion that matters in the end is that of the attending physician, who is Maddie’s pediatrician – she’s the decision maker. She said that her x-ray showed some signs of improvement in the right upper lobe (I didn’t know lungs had lobes…my high school anatomy teacher is shaking her head). It also showed some mucus plugs that are causing areas of atelectasis. And, there was some sort of “shadow” on her lungs that could either be excess fluid or pneumonia. Her pediatrician decided to give her a single dose of a diuretic called lasix. If the shadow is not pneumonia, then the lasix will make that shadow smaller by removing some of the excess fluid. If it is pneumonia, then Maddie will start taking antibiotics. In the meantime, she is still on oxygen. She’s back down to 1/2 a liter per minute, but they just can’t get her lower than that. It’s so frustrating. She had deep suctioning today. A respiratory therapist or nurse threads a long, skinny catheter through her nose down into her lungs and tries to get all that mucus out. I can’t stress how much she hates this. She screams until she doesn’t make any noise, and her face turns as red as fire. It’s hard to watch – my mom has to leave the room when it happens. But it helps, and we have to focus on that. She had more visitors yesterday, so that was fun! Our friends Catherine, Matt, and Leslie came by to say hi and play with Maddie. 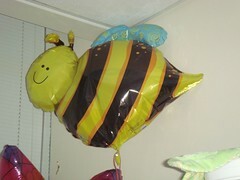 Matt and Leslie also brought Maddie a bumble bee balloon, so Maddie has quite the menagerie of garden creatures keeping her company in 5444A. It’s great to get visitors, it helps break up the days. We’re finishing day 10 here in the hospital and we’re all getting to the breaking point. So, fingers crossed that lasiks does the trick and we get sprung from here soon. On her eighth birthday, she must choose.On her eighth birthday, she must choose. I wish I lived close by so that I could come and visit. Believe me, I know what it’s like to spend weeks in the hospital (since I was on hospital bed rest the last 6 weeks of my pg). Look out for a box coming your way! If you need anyone to talk to, dont hesitate to call. Our girls are practicaly the same age after all! I’ve never commented before because I only recently located you blog (and then proceeded to read it from start to finish), but I wanted you to know that I’m praying for Maddie and I’m optimistic the lasix will help. It helped my mom immensely recently when she had fluid in her chest. Keep us posted!